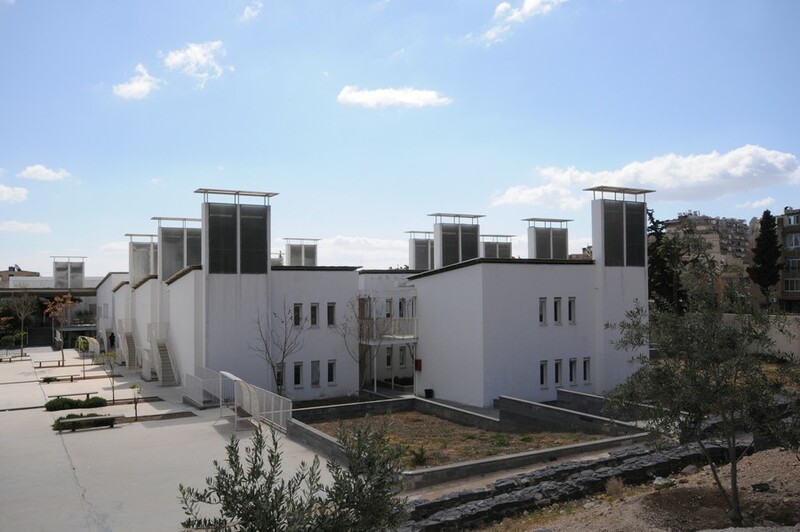 This education building in Damascus, Syria, has been shortlisted for the Aga Khan Award for Architecture in 2013. In designing school facilities in this desert climate, the architects opted for natural ventilation, a decision with crucial implications for the morphology of their solutions. The Syrian buildings are typically two-storey patio structures each giving onto a small, lush, and sheltered garden. The garden is the building block, creating the microclimate, feeding cool air into the ventilation system through PVC pipes, made to circulate by means of the updraft created by solar chimneys. The walls are double-block for its thermal properties: solid concrete on the inside and concrete breeze-blocks on the outside, separated by an air pocket. The classrooms are arranged in rows on both sides of major axes, in a pattern of alternating buildings and gardens. Despite the Syrian Civil War, As of 2015 the school has remained open. Charles de Gaulle is a French international school serving the levels maternelle through lycée.